If you loved the cheesy chart music in the 80s then this is the show for you. This show is filled with hit after hit from the 80s, worked in to a storyline. It also has the associated garish and outlandish 80s outfits and big hair. This is a brand new musical, that only started on 24th January this year so this is only the second week of the tour! It is being marketed as the 1980’s answer to Love Island, which was obviously a bit tamer back then! The story starts with a couple who are due to get married, Lorraine (Karina Hind) and Olly (Cellen Chugg Joes), but one of them gets cold feet and calls it off. Both of their sets of friends then convince them to still go abroad when they were supposed to be on honeymoon. The girls knowingly check in to the honeymoon suite that was booked. The boys don’t realise it’s the hotel booked for the honeymoon as they just got a taxi to drop them at a hotel. The hotel is due an inspector, so the staff are on the look out for one. Before the stage moves from the initial split house and church setting to the hotel, Garry (Joe McElderry) comes out on to the front of the stage and starts an interactive sing along with the audience, as if the audience are guests at the hotel. The joint hotel owners, Robert (Neil McDermot, who I recognised from Eastenders) and Serena (Amelle Berrabah, from the Sugababes) panic about what to do about an inspector visiting while Garry whizzes around the customers. 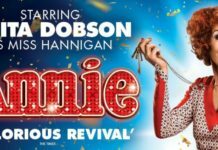 They also have an entertaining cleaner, Consuela (Kate Robbins) who pops up at various times throughout the show with comedic lines, outfits and entertainment. She reminded me a bit of a dame role in a pantomime, there to provide the extra laughs throughout the show. The boys have their luggage stolen before arriving at the hotel. Garry kindly offers to lend them some fancy dress for the evening do, which is entertaining. Part of the evening entertainment is Blind Date, which the guests get roped in to. Following the entertainment, one of Lorraine’s friends, Tracey (Rebecca Mendoza) makes a play for Olly, with a hilarious routine. Christine (Emily Tierney) is an upmarket guest with a twist, who tries to woo Robert and get his full attention but ends up in some unfortunate situations. Later, once the staff realise that the flamenco dancers, that they thought were going to score them high with the inspector aren’t coming, Garry and Blaine (Kane Verrall) create their own version, which then also involves Consuela, Serena and Christine. The stage is mainly the reception area of the hotel but also transforms to the entertainment area. It is fairly simple but works well. The Alhambra Theatre is an impressive looking building in the centre of Bradford. It has several car parks nearby. It is a traditional theatre, although the main entrance to the theatre building on the ground floor looks modern. On the ground floor there is a ticket kiosk and a kiosk for purchasing soft drinks and sweets. On the first floor is an impressive bar and a cafe area, which sells cake; my kind of theatre! All the staff we encountered were friendly. We parked at the local NCP car park, which is just around the corner from the theatre. On queuing up in the car park I realised that we could have got a ticket from the theatre to get the first hour of parking free. I hadn’t realised and hadn’t seen it mentioned anywhere in the theatre. In the programme there is an introduction from Mark Goucher, the producer of the show. In that he says, ‘We have tried to make a fun show with some great music. 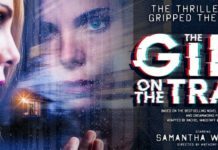 We are not trying to win any prizes but to give you a great night out.’ This was definitely achieved and the audience, which was mainly female, were dancing, clapping and joining in at the end. I acknowledge that this was clearly a theatrical performance but some of the songs sounded a little oversung. This may have been down to the sound levels or the enthusiasm of the cast. On occasion I had to remind myself that several of the cast had been singers, so it wasn’t that they couldn’t sing the songs. It may be that they are still all a little too eager as the cast all seemed to be genuinely enjoying themselves on stage, but I would have liked to have heard some of the songs sounding a little less shouty and a little more melodic. However, the way that the songs were sung fitted in with the feel good theme. I was pleased to see one of their first shows but would also like to see them perform once they’re a few months in to see if they are a bit slicker sound wise by then. I enjoyed the performance but for the reasons given above, around some of the songs not being as tuneful as I expected, I rate this 4/5. 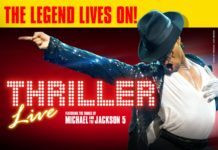 Tickets cost from £11.50 to £32.50 (booking fees may apply). 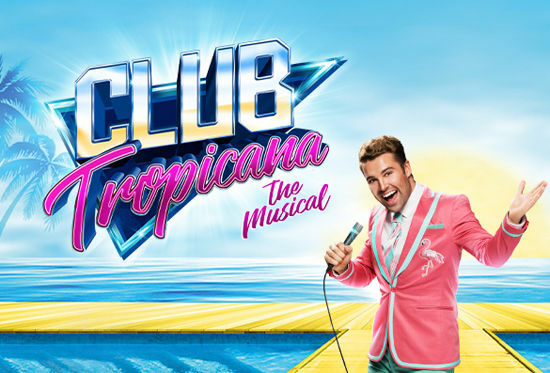 Club Tropicana The Musical is at the Alhambra Theatre in Bradford from 4-9 February 2019, for more information or to book tickets visit www.bradford-theatres.co.uk or call the box office on 01274 432000.